I don’t know if Udofia starts right away at the point for Georgia Tech but I think he should. I agree with your comment about him at the point and Shumpert at the two. The Tech coaches tell me that won’t happen right away. One of the biggest issues with the Yellow Jackets is a collective lack of toughness on the team. The team needs a leader in the clubhouse and they need someone to push them to new heights. Udofia clearly does bring that element to the table. As far as Udofia as the number two player in the state…he is right now. After his performance against Centennial and Lorenzo Brown, it is hard to argue against that. All of that being said, I think Brown has a higher upside, albeit not by much. If Brown can continue to fine tune his point guard skills, he is a better professional prospect. Udofiia’s work ethic and competitiveness will be hard to argue against. He reminds me of former Virginia star Sean Singletary in that regard. This should develop into a nice ongoing conversation as these guys hit conference play. The country’s top high school senior prospect, John Wall, spoke to Jason Jordan of ESPN.com about his recruitment. He also has Baylor, North Carolina State, Oregon and Kentucky on his list. “Those are the two coaches who I’ve had the best connection with so far because they’ve been in for in-home visits,” Wall said of Bill Self and John Calipari. Wall told ESPN “probably” when asked if he was a likely one-year-and-done college player. The ACC Tournament is my favorite college basketball tournament, which is no suprise, considering I am such a big fan of the ACC. 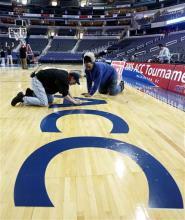 Now there’s an awesome way to find the cheapest prices on ACC tournament tickets. This link shows all of the cheapest ACC Basketball Tournament tickets dynamically. It updates all of the time, searching all available tickets and listing the cheapest ones. It’s a fantastic way to keep up with the prices, which tend to go up as the tournament approaches. This year the tournament is being held in Atlanta, GA, which should mean more fans can attend due to seating. The location of the ACC tournament is a bit of a bone of contention, with so much of the ACC focused on North Carolina. Teams outside the state of NC cry foul that Duke, NC State, UNC and Wake Forest can play so close to home, but the center of the ACC schools is squarely between Durham and Chapel Hill. This year, Georgia Tech fans will have the shortest trip to the tourney, but it’s closer for Florida State and Miami as well. Clemson fans are probably slightly closer to Atlanta than Chapel Hill. On Tuesday January 13 two 4A conference rivals took the court in Boone, NC and featured some stellar play from both teams. Watauga came out on top with an 80-74 win at home. Cody Shuffler– (SF, 6’6’’, 2009) Kept East Burke in the game with his solid post play. Shuffler has the height of a SF but has the overall body mass and strength of a PF. Very strong, powerful lower body. He was forced to play C or PF the entire game because the lack of interior size that East Burke possessed but still demonstrated his skill set well. On a night when Shuffler’s mid range shot was off, he still showed great touch around the basket as well as good form and lift on his jumpshot. Shuffler has a definitive go to move to get around defenders on the low block, spinning baseline on the right side several times to score. He showed good defensive presence by blocking or changing many shots in the paint. Shuffler was able to score 29 points even on an off shooting night to lead his team. To play his true position of SF Shuffler needs to improve his ability to guard on the perimeter as well as his ball handling. Josh Debro– (SG, 6’4’’, 2010) A rangy, athletic defender for East Burke caused havoc for Watauga’s players all night. In a press defensive scheme Debro shined; usually playing the middle in the defensive setup and came up with four steals in the second half alone. Debro showed great recovery speed and covered the whole floor on defense coming up with several come from behind blocks and deflections. A great offensive rebounder coming from the weak side. Debro finished with 7 points, 5 steals, and 8 or 9 rebounds. Debro still has another year to improve his shooting ability but has some great potential as a shooting guard. Jeff Newell– (PF, 6’6’’, 2009) was the driving force for Watauga. The undersized PF/C showcased that he may have the ability to play SF on the next level with his bevy of finesse post moves and overall range on his shot. At one point Newell hit back-to-back three pointers and a one dribble pull up from 15 feet to demonstrating his shooting touch. Has good timing on his jumps, which helps make up for his lack of size (weighs 185) on rebounding. Had some trouble guarding the much heftier Shuffler on the low block but did show good footwork and quick hands on defense. Newell is calm when handling the ball some on the perimeter but seems uncomfortable when forced to defend on the perimeter. Shot very well for the entire game and finished with 31 points. Needs to bulk up and work on perimeter defense. SNY, the television home of the New York Mets, Jets and BIG EAST Conference, today announced that the 2009 SNY Invitational presented by Time Warner Cable will tip off January 23-24 at 6pm and showcase four of the top ranked high school teams in New York. The teams include Jefferson, Mount Vernon, St. Raymond and Boys and Girls High School. All games will be broadcast live on SNY and feature SNY commentator Kevin Burkhardt calling all the action alongside SNY’s BIG EAST basketball analyst Tim Welsh. Brian Custer, host of the WheelHouse on SNY, will handle the sideline duties. The SNY Invitational presented by Time Warner Cable was established in January 2008 with the goal of creating an annual high school basketball tournament that will be both a pillar of SNY’s involvement in the community, as well as New York’s elite high school basketball event. Throughout the two-day tournament, SNY will provide exposure to the schools and students by televising the games, as well as producing multiple vignettes and human interest pieces about the individual schools and their teams. In addition, SNY and Time Warner Cable’s NYC Region will make a donation totaling $20,000 to the participating schools. “Time Warner Cable has a long tradition of supporting educators and students. This includes free cable television and high speed online service to schools, scholarships and a number of initiatives offered throughout the year. This partnership with SNY is another example of how we encourage students to reach their full potential,” said Harriet Novet, Regional Vice President, Public Affairs for Time Warner Cable’s NYC Region. “We’re thrilled to once again support local high schools. Our customers can watch these games conveniently through local on demand Channel 1111,” added Novet. In addition to stellar high school basketball, the SNY Invitational presented by Time Warner Cable will showcase prominent entertainment acts throughout the two-day event, such as E3 Dance Crew – a Hip-Hop dance crew that has competed in a plethora of competitions and is currently the 2008 Showtime at The Apollo dance champion, and Extreme Team, which combine the talents of gymnasts, tumblers and trampoline specialists known for their unique acrobatic slam-dunk performances. Other performances include Street Beats Group, a New York City-based dance and percussion troupe that combine the excitement and energy of off-Broadway hits like “Bring In Da Noise,” “Stomp” and “Blue Man Group” with their original, high-energy music and choreography. In addition, Acroback, a world class group of break dancers and tumblers will also perform at the event. Fans in attendance will receive gift bags containing such valuable items as two New Jersey Nets tickets. The 2009 SNY Invitational will take place at New York University’s Coles Sports Center in Manhattan. Time Warner Cable will serve as the presenting sponsor of the tournament. Other official sponsors of the event include the New York Daily News, McDonald’s, 2K Sports, Spalding, StubHub and New York’s 529 College Savings Program. SNY is available on Channel 26 and in high definition on channel 726 to Time Warner Cable NYC Region customers. Games will also be available on Channel 1111, Local Video On Demand, for Time Warner Cable customers in Manhattan, Staten Island, Queens, Brooklyn, Mt. Vernon and Bergen County, New Jersey. For additional information on the SNY Invitational, or to purchase tickets, visit http://www.snyinvitational.com . SNY – which launched in 2006 – is the official television home of the New York Mets, Jets and the BIG EAST Conference. Featuring unparalleled access to the New York Mets with more than 120 live telecasts – all produced in HD – and other critically acclaimed Mets programming, SNY also delivers over 250 hours of year-round – exclusive – in-depth New York Jets content. As the official TV home of the BIG EAST Conference, SNY will air more than 125 BIG EAST football and basketball games, as well as other BIG EAST programming. As New York’s leader in local sports coverage, SNY delivers the most comprehensive sports access to all of the Tri-State area’s professional and collegiate sports teams through five nightly sports and entertainment programs broadcast in state-of-the-art HD from the network’s street-level studio in the heart of Manhattan. SNY’s programming roster also includes classic sports programming, original entertainment shows and exclusive interview and magazine programs. Founded by Sterling Entertainment Enterprises, Time Warner and Comcast, SNY is available to viewers throughout New York, Connecticut, New Jersey and northeastern Pennsylvania, and nationally on DIRECTV, Dish Network and AT&T U-Verse. For additional details on the network, visit http://www.sny.tv . Time Warner Cable is the second-largest cable operator in the U.S., with technologically advanced, well-clustered systems located mainly in five geographic areas — New York State (including New York City), the Carolinas, Ohio, southern California (including Los Angeles) and Texas. As of September 30, 2008, Time Warner Cable served approximately 14.7 million customers who subscribed to one or more of its video, high speed data and voice services, representing approximately 34.2 million revenue generating units. One of the top high school prospects in the nation for the class of 2009, if not the top prospect, is big man Derrick Favors (PF, 6’9″, 2009), a player who everybody wanted, not the least of which Georgia Tech, NC State and Florida State. All signs seemed to point to Favors staying in state for what might be a one-and-done college career, and now he’s chosen the Yellow Jackets as his college destination. You might be following the recruitment of Tobias Harris (PF, 6’7″, 2010), one of the ACC’s top recruits, and you might have see our recent Q&A with Harris and heard that a few ACC teams are still in the mix for him. The next morning i got MRI results stating that the ligaments in my ankle were torn. It was devestating news for me. But everything happens for a reason and what doesnt kill you makes you stronger. The doctor said I’ll probably miss six to eight weeks. You are currently browsing the ACC Basketball Recruiting blog archives for January, 2009.